Operation Write Home had a Virtual Card Making Party for the 4th of July. The 18th and final challenge was hosted by Cara at Crafting Adventures. 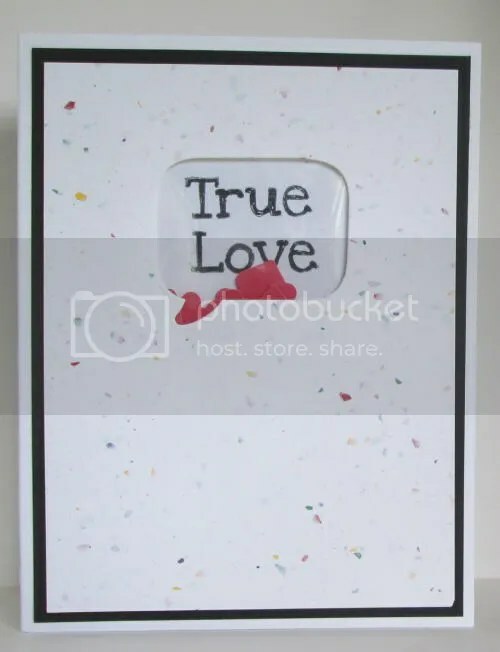 Use a faux technique on your card. My card is another happy accident. 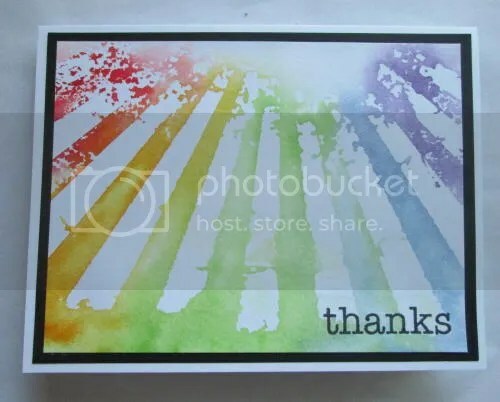 For the Texture challenge, my first attempt started by using the Tim Holtz Rays stencil with Distressed Inks to create a rainbow pattern on a card. Then I used a Rays embossing folder with it but the rays didn’t match and the card became trash. The stencil was sitting in front of me, still covered with ink and I had a VOILA moment. So, using his handy dandy 12 months of tags June technique, I spritzed some water on the inky stencil and put it ink side down on cardstock. When I pulled the stencil up and used my heat gun to dry it, I realized the resulting image looks as though I was standing in a woods of rainbow hued trees, looking up to a bright sun. GP White, Recollections Black, Distress Inks Barn Door, Spiced Marmalade, Mowed Lawn, Faded Jeans and Dusty Conord. Doodlebug sentiment in Memento Tuxedo Black. Operation Write Home is having a Virtual Card Making Party for the 4th of July. 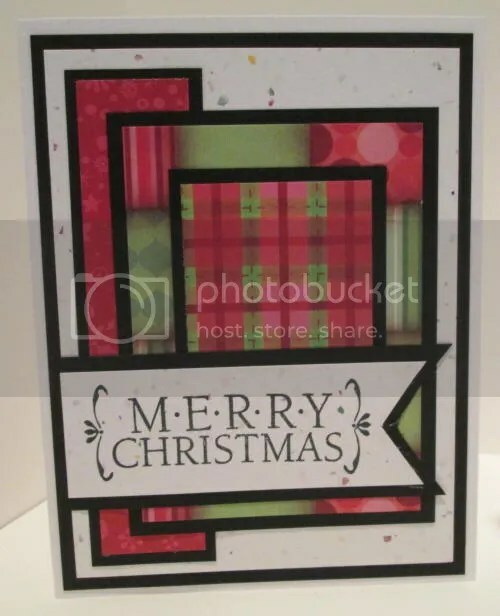 The 17th challenge is hosted by Sherry at Bits of Cheer and is to create a Christmas card using Inchies. I decided to use OWH Sketch #175 for mine. I tweaked it a bit to add a sentiment. It’s covering part of the inchies but they are there. GP White, Recollections Black, DCWV Xmas pack, TPC Christmas Cheer gems+ Hero Arts CL359 in Memento Tuxedo Black. The eighth challenge is hosted by Cherie’s Corner of the World and is a recipe style – make a Miss You card with at least 1 circle and 2 banners. 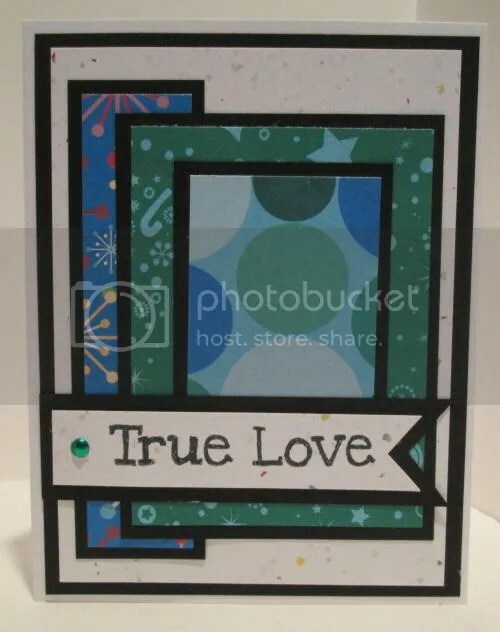 The ninth challenge is hosted by Andrea at Crafty Tafty and is to create a masculine card with a vintage style image. 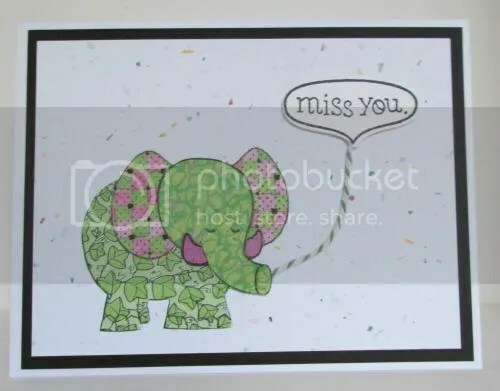 I decided to combine the two so my card is a “masculine miss you with a vintage image plus two circles and banners”. This stamped image actually says “moving forward” but all that makes me think of is the Modern English song “I Melt With You”. 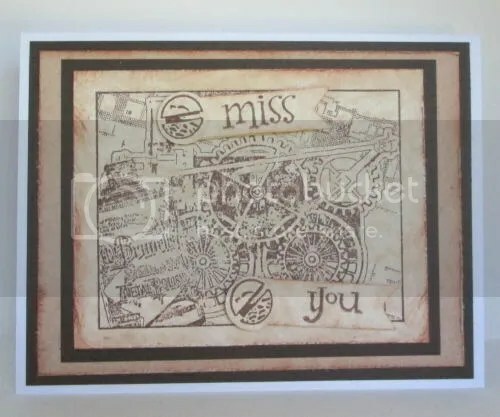 I took an “I miss you” stamp, put it on 2 separate banners and then popped them with The Precious over the words, adding a screwhead detail as well. GP White, Recollections Brown, Graphics 45 The Kraft Collection. TPC Parchment. Eco Green Steampunk Accessories 2 & TPC Studio Whimsy Greetings in Memento Rich Cocoa. Distress Inks Vintage Photo. Tim Holtz edge distresser. The Precious. The seventh challenge is also the July Our Daily Bread Designs Challenge. Things with Wings. GP White, Recollections Black, Xerox Flecs Cover, We R For the Record – Take Note – Lawn Fawn The Science of Love + A Birdie Told Me in Tuxedo Black. Stampin’ Up watercolor pencils + Tim Holtz water brush. The Precious. 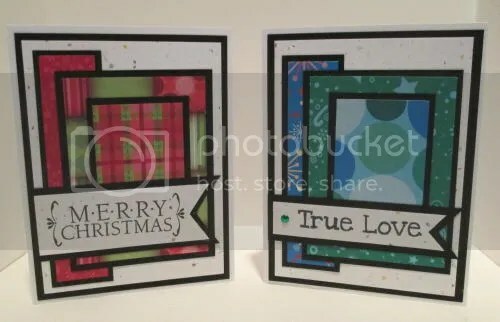 The sixth challenge is hosted by JoAnn Ross – make 2 cards for winter, one using Christmas colors and one using colors that would allow it to be used the whole season. 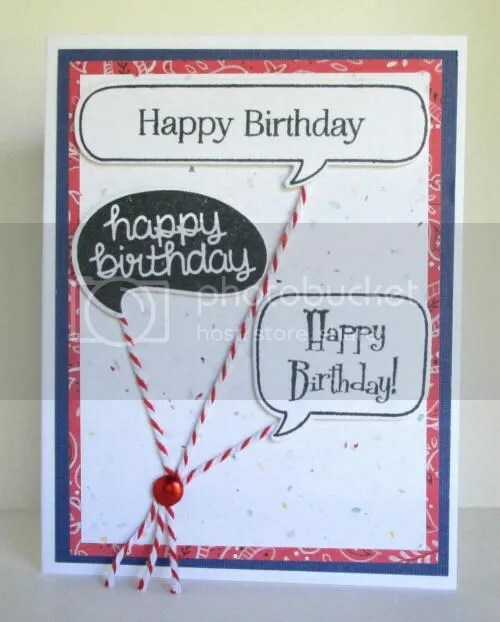 I decided to use the same OWH Sketch – #191 – that she used for her cards, but I changed the order of the layers so that the banner could be for my sentiments. 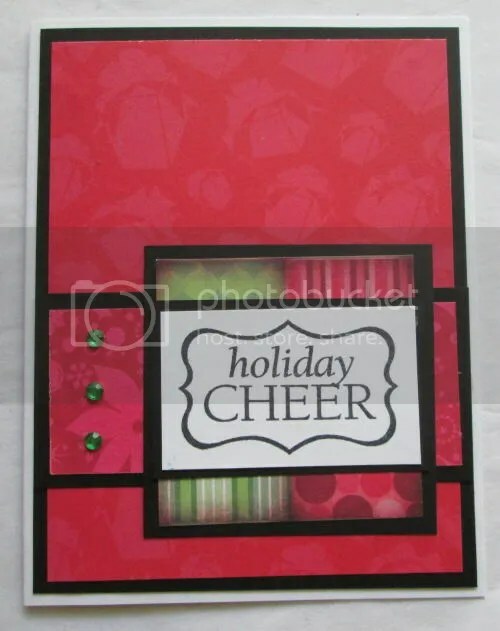 I’m also entering this card into the Shopping Our Stash / The Jingle Belles Challenge – Use an item that has been in your stash for at least one year. One year, how about ten? This DCWV paper is from 2004ish. GP White, Recollections Black & brad, Xerox Flecs Cover, DCWV Xmas pack, TPC Hugs & Kisses + Hero Arts CL359 in Memento Tuxedo Black. 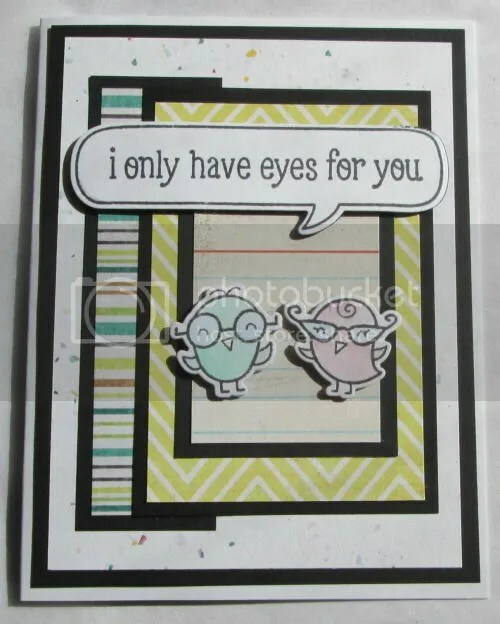 The fifth challenge is hosted by Beth at BunnyScrap – make a card using a colorful background that you’ve created with ink, paint or scraps. This worked out well for me – my first attempt at Challenge #2 ended up being more purple than red and blue so I put it aside to make another. That first attempt is going to be front and center here. This is the technique that Tim Holtz featured in his 12 months of tags – June. GP White, Recollections Purple & brads, Xerox Flecs Cover, Tim Holtz stars stencil, Distress Inks in Barn Door, Faded Jeans & Dusty Concord, Doodlebug Thanks. Sizzix Star Sizzlit. No id sequins. 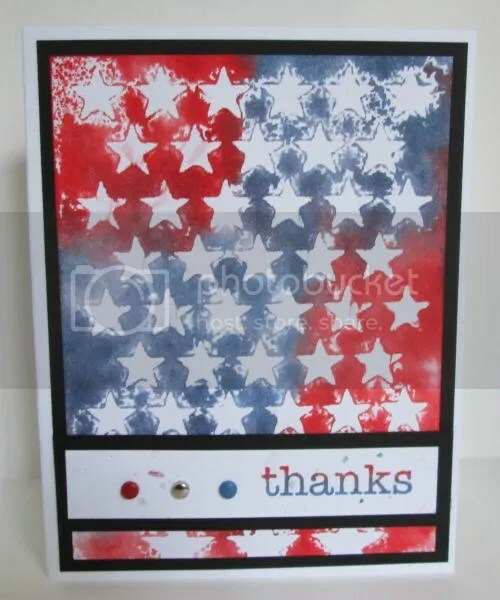 The fourth challenge is hosted by Lori’s Kreations – make a red white & blue birthday card. GP White, TPC Color Connect Texture Dark Blue, No ID red DP, Xerox Flecs Cover, Lawn Fawn Chit Chat & a Birdie Told Me Speech Bubbles + Hero Arts OWH Birthday set & TPC Cupcake sentiments in Memento Tuxedo Black. Pick Your Plum Baker’s Twine, Recollections Brad. The Precious. The third challenge is hosted by Kelly at A2Z Scrapbooking Supplies – make a card with paper piecing for kids. GP White, Recollections Black & elephant stamp, Xerox Flecs Cover, Lawn Fawn Chit Chat in Memento Tuxedo Black. Pick Your Plum Baker’s Twine, The Precious. 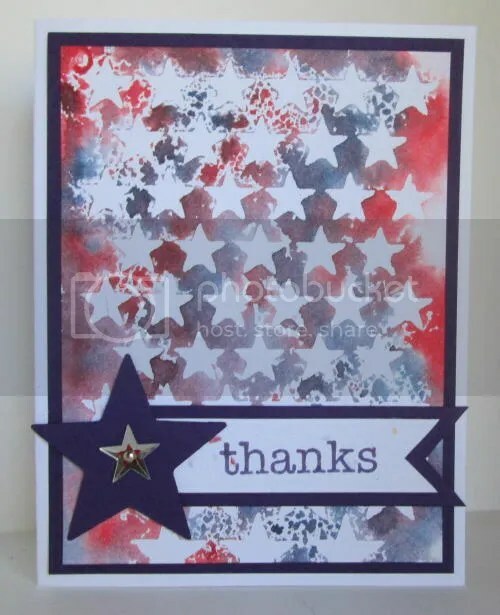 The second challenge is hosted by Michelle at Caffeine & Stamps – make a Thank You card with a bonus points if you make your own fireworks using spray inks. Well, I don’t have any spray inks and I don’t want to buy any spray inks because I don’t need to find another product that I MUST HAVE IN ALL THE COLORS BECAUSE REASONS… Ahem. Excuse me. It’s OK, everything is fine. Anyway, because I don’t have any spray inks, I decided to use the technique that Tim Holtz featured in his 12 months of tags – June. The card below is my second attempt because I got very into putting red and blue all over the stencil for the first card and then ended up with a lovely purple and white design… It might make an appearance on another post. GP White, Recollections Black & brads, Tim Holtz stars stencil, Distress Inks in Barn Door & Faded jeans, Doodlebug Thanks. The challenge this week at the Simon Says Wednesday Challenge is Shake It – have a shaker element on your card. This is my first time doing this and so had to try a couple different things to get an effective shaker. 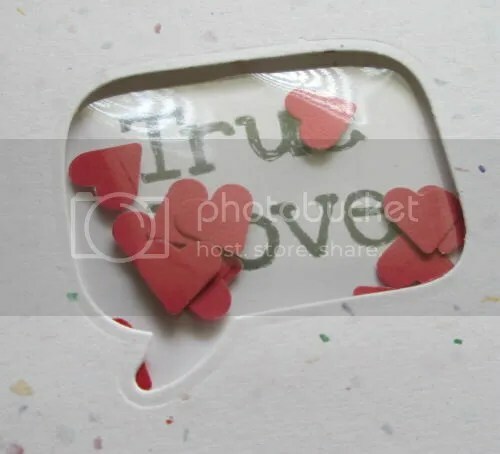 In the end, I took a piece of Lawn Fawn diecut plastic packaging (I keep the dies in a tiny ziplock bag with the matching stamps), folded it in half, added adhesive to the edges, put my hearts in the center and then sealed the edges. I adhered this over the sentiment panel and then added the top layer using dimensional adhesive. *Because of my recycling of plastic, this also qualifies as an entry into the Less is More Week 178 challenge – Use a recycled item. TPC Black Linen, GP White, Xerox Flecs Cover, Colorbok Red, Lawn Fawn A Birdie Told Me die, TPC Studio Hugs & Kisses in Memento Tuxedo Black. The Precious. Recollections heart punch.